With some preplanning and ingenuity, celiac patients can enjoy a variety of foods and celebrate the season. Christmas Day may not be officially here yet, but you can bet many of your clients who celebrate the holiday are thinking about and preparing for the family feast and all the other festivities associated with the season. They’re looking forward to tasting the appetizers, eating the main meal, sampling the desserts and, with arms held high, making toasts to family and friends with the clink-clink of champagne glasses. Clients who have celiac disease, however, may not share as much enthusiasm. For them, attending these family soirees and participating in the food preparations can be stressful. After all, they must ensure that every bite of food they take contains no gluten. But from the holiday turkey dinner to the seasonal treats gracing office cubicles, there are plenty of opportunities for RDs to help celiac patients celebrate the season with a bang and serve up their own special brand of holiday hospitality—gluten free. Read on to find out how. The reason holiday parties are stressful for celiacs is because the majority of favorite foods are carbohydrate based, such as cookies, pies, casseroles, and breads. “These foods are wheat/gluten-based products that pose a danger for someone with celiac [disease],” says Jaime Schehr, ND, RD, CDN, a private practitioner in New York City. In addition, holiday spreads often are served buffet style, preventing anyone from determining the ingredients to ensure the foods are gluten free. Another common challenge celiac patients face each holiday is that family and friends often cook for a group. And even if they know one of their guests has celiac disease, they may not know how to properly assess gluten-free ingredients, Schehr explains. “Many times I’ve seen people bring dishes they call gluten free because they didn’t see the words ‘wheat’ or ‘gluten’ in the ingredients; however, the cook usually is unaware of hidden sources of gluten,” Schehr says. If it isn’t possible to confirm what every item on the buffet table contains, celiacs should stick to what they know. They should eat the fruits and vegetables, nuts, olives, plain meats (not deli meats), and cheeses. Latson says dietitians should explain to patients that the bright side of navigating parties and packaged food aisles is that it encourages celiacs to be assertive in taking care of themselves, and it forces them to eat mindfully. “Mindful eating benefits both body and spirit and is woefully underpracticed in our western world,” Latson adds. While many specialty stores and grocery store chains are well stocked with ready-to-eat gluten-free snacks, cookies, and desserts, these grab-’n’-go gems also can take a bite out of the wallet. 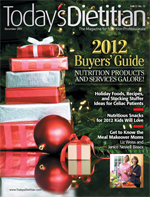 “So preparing gluten-free holiday items at home is a great option,” Latson says. Nothing beats custom-made trail mix for the flavor that combines sweet and salty. You can take the basic trail mix recipe from www.chex.com/recipes and create many variations based on favorite ingredients, including M&Ms, chocolate chips, and dried cranberries or cherries, in addition to gluten-free pretzels, nuts, and sunflower seeds. For a classic decadent chocolate dessert, you can make flourless chocolate cake with ingredients you already have at home. “The recipe is in many cookbooks and also online at www.allrecipes.com,” Latson says. Rice Krispies squares are easy for kids to make using gluten-free puffed rice and most brands of marshmallows with the addition of M&Ms or chocolate chips. Latson adds that during the holidays, seasonal desserts such as baked apples or poached pears are special treats everyone can enjoy. “Puréed pumpkin is a great gluten-free seasonal ingredient that can be included in gluten-free pancakes and other desserts,” Latson explains. Bernadette Latson, MS, RD, LD, provides her favorite recipe for a gluten-free Swiss-style meringue, a dessert base or cup that includes just three ingredients. European restaurants call this Pavlova. 1. Allow eggs to come to room temperature and then beat along with the cream of tartar until frothy. Gradually add the sugar until the mixture forms stiff peaks. Check between your fingers to ensure the sugar is fully dissolved. 2. Scoop or ladle the mixture on to a cookie sheet, and gently create an indentation with the back of the ladle. Bake at 250˚F for at least 1 hour until meringue becomes dry and crisp. Cool on a rack. These may be stored in an airtight container for several weeks. Serve as cookies or as a container for fresh fruit topped with a little whipped cream. The book Gluten-Free Cookies: From Shortbreads to Snickerdoodles, Brownies to Biscotti—50 Recipes for Cookies You Crave by Luane Kohnke (Sellers Publishing Inc., 2011), makes a great gift for people who need or wish to follow a gluten-free diet. The book contains tips for maintaining a gluten-free kitchen, a list of gluten-free baking ingredients, as well as sources for the items. It has special chapters for classic cookies, children’s cookies, and cookies for special celebrations. This recipe is from the book. Crunchy on the outside, fudgy on the inside, that’s what these yummy peppermint cookies are like. If you’re a fan of the flavorful combination of chocolate and peppermint, these will be on your must-make list. 1. Preheat oven to 350˚F. Line cookie sheets with parchment. 2. In a medium bowl, sift together the powdered sugar and cocoa. 3. In the small bowl of an electric mixer, combine egg whites and salt. Set mixer speed to high and beat until soft peaks form. Add sugar-cocoa mixture, 1 T at a time, until thoroughly combined. Set mixer speed to low. Mix in vanilla and peppermint extracts. Add chocolate chips and mix until thoroughly combined. Dough will have consistency of thick frosting. 4. Using a small cookie scoop, shape dough into 1-inch mounds and drop onto prepared cookie sheets, spacing them about two inches apart. Bake until tops are shiny and faintly cracked, about 10 to 12 minutes. Cool completely on cookie sheets. 5. Store cookies in an airtight container for up to five days.